A number of Home buyers prefer to take the route of visiting open houses on weekends as a way to start their real estate search for their dream home. Doing so gives them a broad based view of several things including seeing various kinds of homes, features, localities, decor, landscaping, and importantly meeting and quickly interviewing Realtors of various caliber. This is certainly the good part of this approach. However, there is something that you can do to make your home buying experience more effective and efficient enabling you to land your dream home faster. Hosting open homes on a frequent basis, I come across many prospective buyer clients looking to buy their first or second home. Visiting open houses, the prospective buyers can ask very good questions to try to get a hang of the buying process intermingled with questions around the house they are looking at. I provide folks with direct, clear answers to the best of my ability in the short time we get to interact amidst the busy time with others wanting to ask similar questions. I try to provide as much guidance as possible around how to go about their home search successfully as well. In many cases, I prefer to have prospective home buyers come over to my office to spend quality time 1x1 to help them understand the real estate purchase process better and to educate them about the many things to look out for when buying a home and go over the offer documents ahead of time. In many cases, the home search goes on for months without ending in a home purchase due to various reasons. As market situation improves, buyers are confronted with multiple competing offer situations, and the number of houses on sale that are within their budget dwindles down leaving them frustrated and disappointed. I can totally relate to this situation and I have myself been in that situation in the past as a home buyer. Many of my buyer clients have related such experiences and in some case, it is only after such long winding experiences that I see them coming back to me after meeting initially at an open house months ago, to learn about the buying process to make it more effective. What can the buyers do to get more effective results? Buying a house is a huge financial decision and while you should avoid getting into unsustainable over-budget bidding, there are often things you can do to target the right homes to focus on. The key to any successful financial decision lies in getting organized and doing the necessary research to get fully educated about what's involved. Buying Real Estate is no different. Getting organized and getting educated lays down the necessary foundation so that you will have set out on your home search on a stronger footing. In order to better achieve this goal within a set amount of time, it is essential to get organized with all the necessary information. Getting a good Realtor, who will educate and guide you, besides writing offers and negotiating for you, is one of the first and best steps to do this but there are things you can do even before that step. Put together an organized list of wants and needs. We all have many wants but real needs are usually a smaller set than our wants. Without an organized list of wants and needs, going house to house is akin to losing your way in a jungle. It costs you time, money, emotional drainage, and frustration. Another impact of the lack of preparation is that once you're in the thick of viewing homes, it's all too easy to fall in love with the interior decoration or a homeâ€™s outstanding architecture. You may end up completely overlooking the fact that there aren't enough bedrooms or bathrooms to fit your future needs. Or that the layout of the house would not help as you grow as a family over the years. Get together as a family/couple/partners and draw up a list of dream home requirements on a writing pad or your favorite tablet device starting with a Goal and Justification. The goal will have a mission statement on what kind of home you want, and why you want to buy a home. 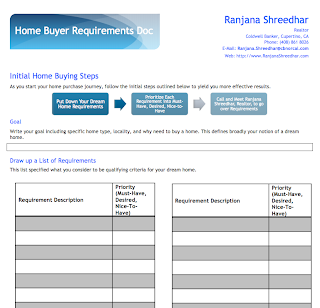 Now add a column in the body of the page, named Home Buying Requirements Description. This column would capture features and facilities that you will expect a home to have in order to qualify as your dream home. Many folks do not know what they are looking for in a house other than the neighborhood, and general looks of the home compared to others they have seen. This is at best a cursory way to organize your needs for such a huge decision. As you prepare your list of requirements, add a column next to the Home Buyring Requirement Description, named Priority. This column would capture the relative importance of each requirement versus the others in terms of numbers starting from 1-Must-Have (most important and a deal breaker if not met) to 2-Desired/Preferred (preferred requirement the meeting of which will motivate you more to make an offer) through to 3-Nice-To-Have( not meeting this requirement is not a deal breaker but will make it imperative to make an offer in a hurry). Now, once you have an exhaustive list of requirements with prioritization, separate out the 1-Must-Haves AND 2-Desired/Preferred list into one page, and the 3-Nice-To-Have list into another page. Essentially, what we are doing above is ensuring that before you step foot into the first home you look at, you are thoughtfully determining your wants and needs, and the difference between the two! By analyzing your needs you will be able to get a clear picture of exactly what you want your new home to look like and have, and how it should function for you. It is important to identify what you envision your home to look like and what features it should have. Writing this down helps to avoid ambiguity later in the home search process. By separating out the Must-Haves and Desired/Preferreds into one page and the Nice-To-Haves into another, you just made two lists: one that describes everything you would like in an ideal world, and the other that lists the features of the home that are an absolute must. It is most likely that you will blend the two lists into one as you progress through the homebuying process. This is a natural and evolutionary process that becomes clearer as you determine what you want and what is available. To make it easy for you, I have made a template Home Buyer Requirements Document for you to download. In sum, getting educated, and getting organized takes you farther along the way in terms of what you exactly want in order to realize your dream of buying a home and enjoying the joys of home ownership. And stay in touch with me and do not hesitate to ask me questions that you want clarifications or guidance on and I will be most happy to answer them and provide you market updates.